What led me to become a Gearhead brand ambassador and running ambassador, you ask? I would have to say the three ‘c’ words above: camaraderie, community and calling. Allow me to explain. I am not native to Northeast Arkansas. When my family and I moved here five years ago, we didn’t know a soul. 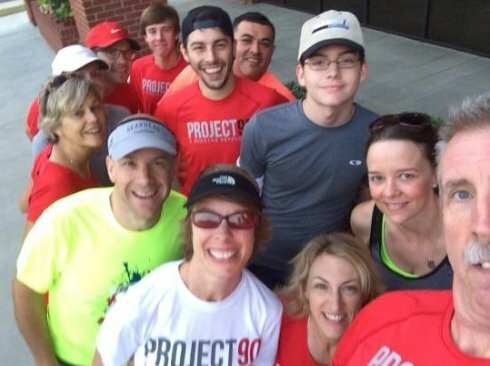 After a few months of getting used to living and working in Jonesboro, we desired to become more active. To ‘gear up’, we visited Gearhead at the downtown location for the first time. I was impressed with the helpfulness of the staff and their willingness to share information regarding activities in and around Jonesboro. Marry the excellent customer service with our preference to shop at local businesses, and the result is a customer enamored with Gearhead. I became a Gearhead brand ambassador because I believe in the company’s philosophy and its active participation in the community. I became a part of something bigger than myself, and made new friends and felt more at home in Jonesboro because of it. Who wouldn’t want to promote a company who cares about its community, fosters active lifestyles, and freely shares expertise with anyone wishing to improve their quality of life? When I developed a love for running, it only made sense to become a Gearhead running ambassador as well. I value the camaraderie among runners, and find it personally motivating to run with others who share similar passions. Because of the encouragement I’ve received from the running community in Northeast Arkansas, I am proud to say I’ve accomplished many feats I never would have dreamed about 5+ years ago. Serving as a Gearhead running ambassador has morphed into a second calling for me. Because I have not always led an active lifestyle, nor been a runner my whole life, my recent journey through personal lifestyle changes have helped me bring encouragement and serve as a role model to others. People who have been consistently active their entire lives can sometimes seem unapproachable to ‘newbies’; I know I felt that way when I was first exploring running and working out regularly at a gym. It’s almost as if lifelong athletes are unable to simplify their advice and expertise enough to reach a novice; they’ve forgotten what it’s like to be in that novice’s shoes, so to speak. I want to serve as a liaison of sorts to folks who wish to lead a more active lifestyle, but aren’t sure where to start. I’d like to think that my positive demeanor, happy smile, approachable nature and personal, recent experiences allow me to perhaps reach those who are hesitant, nervous, scared or unclear about getting started with running or a regular exercise regimen. Full marathon finish with my husband, Joe, at the Mayor’s Midnight Sun Marathon in Anchorage, AK, June 2015. In summary, my experiences as a Gearhead ambassador are central to my persona, happiness, and quality of life in Jonesboro. They have helped me integrate into and serve the community, make new friends, and realize that I have a second calling in encouraging others to lead a healthy, active lifestyle.